For latest neighborhood information tailored to where you live or where you want to buy, please contact me through the Contact Ranjana tab on the right side bottom of the page. Or call me at (408) 861-8026 and I will be happy to work with you on your real estate needs. 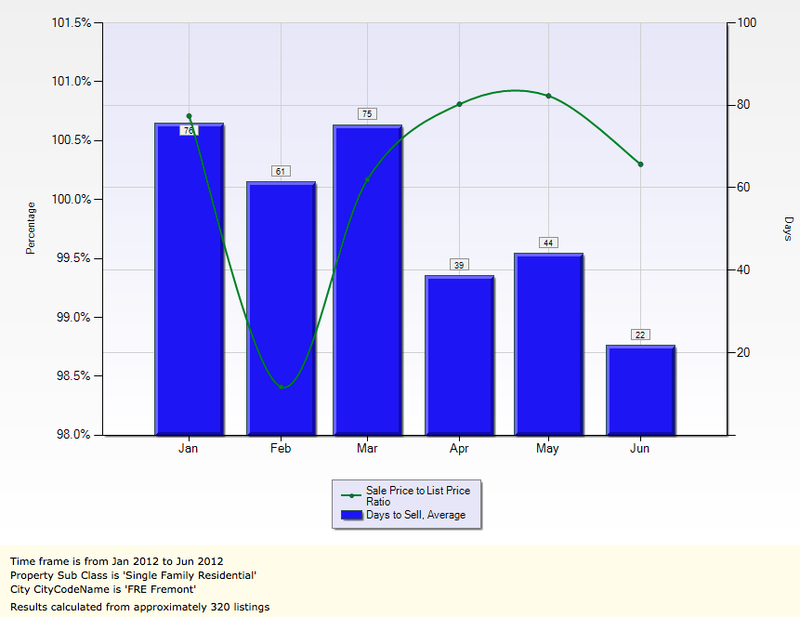 In this blog entry, I provide with you an analysis of the overall Fremont Real Estate market performance in the first half of 2012. In a following blog entry, I will provide a Zip Code-wise break up of the same to help you understand how each zip code in the Fremont real estate area is doing. As always, I would welcome your suggestions, comments and feedback on what you would like to see in this real estate blog. 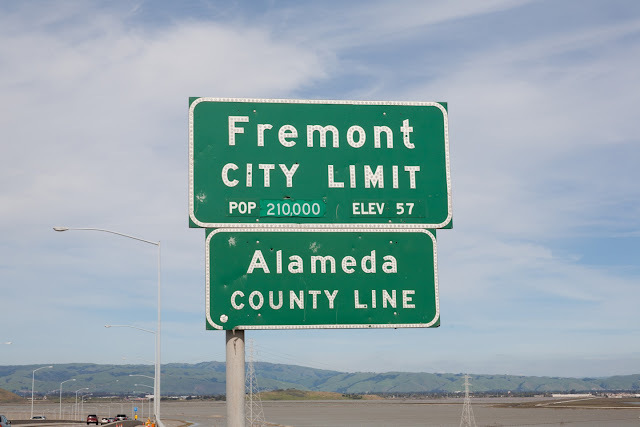 Wikipedia has an interesting brief introduction and historical perspective on the city of Fremont, Alameda County, California. Fremont ( /ËˆfriËmÉ’nt/) is a city in Alameda County, California. It was incorporated on January 23, 1956, from the merger of five smaller communities: Centerville, Niles, Irvington, Mission San Jose, and Warm Springs. The city is named after John Charles FrÃ©mont, "the Great Pathfinder." The area consisting of Fremont, Newark (an enclave of Fremont), and Union City was formerly known as Washington Township, and is now known as the Tri-City Area. Fremont is the sister city to Elizabeth, South Australia; Puerto PeÃ±asco, Mexico; Fukaya, Japan; Horta, Azores, Portugal; Lipa City, Philippines; and Jaipur, India. And in keeping with the fourth most populous city in San Francisco Bay Area, the diversity of Fremont city also contributes to its varied cultural events and coexistence of several different ethnic groups and cultures sharing customs and conventions. The city has a thriving real estate market that has seen its ups and downs over the years. The 2010 United States Census reported that Fremont had a population of 214,089. The population density was 2,443.7 people per square mile (943.5/kmÂ²). The racial makeup of Fremont was 70,320 (32.8%) White, 7,103 (3.3%) African American, 976 (0.5%) Native American, 108,332 (50.6%) Asian (18.1% Indian, 17.8% Chinese, 6.7% Filipino, 2.5% Vietnamese, 2.3% Thai, 1.8% Korean, 1.3% Hmong, 1.0% Pakistani, 0.8% Japanese, 0.6% Burmese), 1,169 (0.5%)Pacific Islander, 13,605 (6.4%) from other races, and 12,584 (5.9%) from two or more races. Hispanic or Latino of any race were 31,698 persons (14.8%). Among the Hispanic population, 11.0% are Mexican, 0.6% Puerto Rican, and 0.5% Salvadoran. Non-Hispanic Whites were 26.5% of the population in 2010,down from 85.4% in 1970. 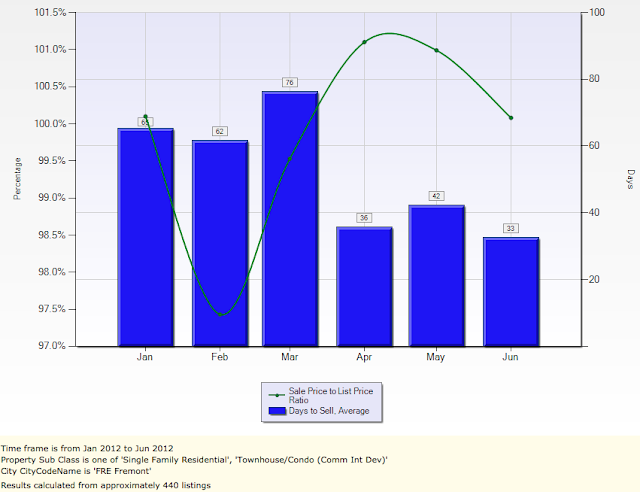 The above chart shows the overall Average Days On Market ( Avg DOM ) and Avg Home Sale Price to List Price Ratio for Single Family Homes, Townhomes and Condos in the Fremont Real Estate Area, Alameda County, California. After ranging between 62 and 75 days in early 2012, the DOM number has come down to 33 days in June 2012, thus indicating a significant improvement in the demand for homes on sale such that houses do not stay in the market as long as they used to in the early part of 2012. 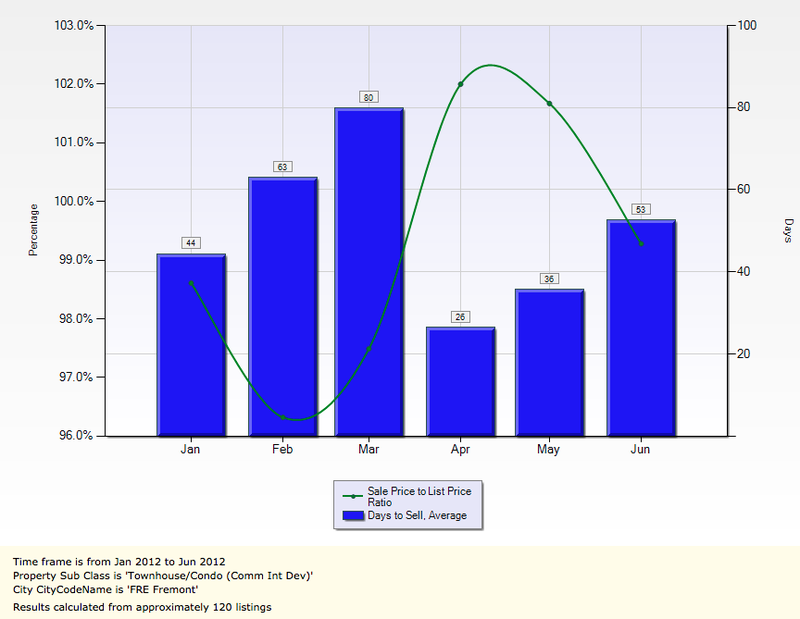 The demand pattern is also validated by the Home Sale Price to List Price Ratio. 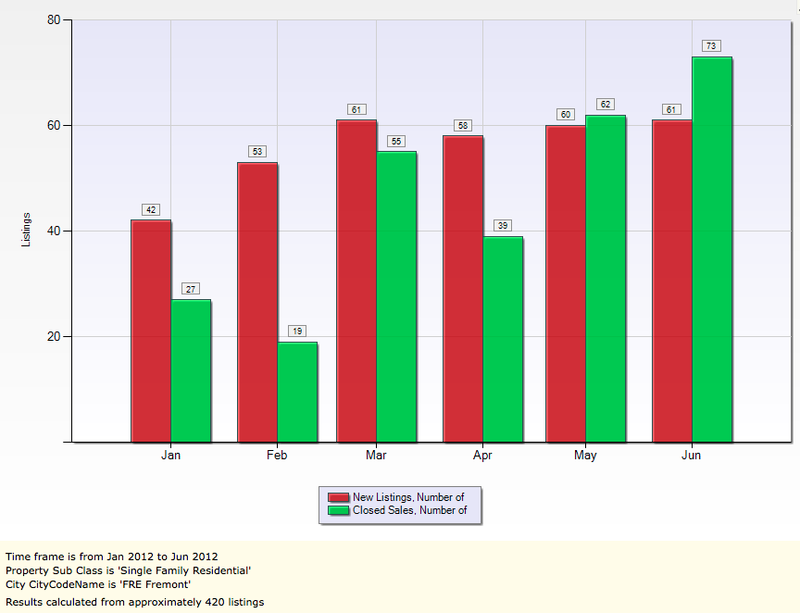 This was at 99.8% of List prices in January 2012 indicating Home Sale prices of homes were roughly close to the List price. The Home Sales price nosedived in February 2012 to approximately 97.4% of List Price and then zoomed back up to touch a maximum of 101.2% between April and May and then again going down to around 100.2% in June 2012. In summary, the above chart shows that Fremont real estate is comprised of a highly price sensitive home buying segment in that although demand for homes has been aplenty, home buyers tend to hold back as Sales price for Fremont homes tend to exceed List price. How did Fremont Single Family Homes do? Let us now see the breakdown of the above chart to separate out Fremont Single Family Homes and then see a chart for Fremont Townhomes and Condos. As seen above, Fremont Single Family homes on sale showed an impressive improvement in the Average Days On Market number coming down from a high of 76 in January 2012 down to just 22 days in June 2012 which is an impressive move up in demand for Fremont homes during the summer buying season. While this is very impressive, the price sensitivity of the buying segment is seen with the zig-zag movement of the Average Sale Price to List Price Ratio swinging down from a high of 100.6% in January 2012 to 98.4% in February and then back up to 100.9% in May 2012 and then down to 100.3% - thus confirming the trend of buyers holding back when sale prices tend to go over list price. How did Fremont Townhomes and Condos do? Listed below is the chart for Fremont Townhomes and Condominiums. The above chart shows a different picture in that Townhomes and Condos in Fremont were accumulating in the early part of 2012 and by March 2012, the Days on Market number was around 80 days up from 44 days in January 2012. The market demand at the beginning of late Spring improved very well in that many home sales closed and this in April, Fremont Townhomes and Condominiums were selling on an average in about 26 days. The situation worsened in the next couple of months but with a trend of accumulation happening in that even with low inventory situation, the Days on Market number moved up in June 2012 to about 53 days. On the Sale to List price ratio, the price swings have also been wide swinging from 98 8% in January 2012 down to 96.3% in February, 2012, then swinging back up to a high of 102.3% only to drop down to 99.3% in June 2012. The above chart patterns confirm the trend that there are many buyer waiting to buy homes in Fremont but are very price sensitive and will hold back if things go crazy. In an ideal world, this market reflects demand and supply theorists in economics in terms of price elasticity of demand. Now let's look at another set of interesting charts. The following shows the number of New listings for homes on sale in Fremont compared to number of homes sold. How did Fremont Single Family Homes, Townhomes and Condominiums aggregated do? 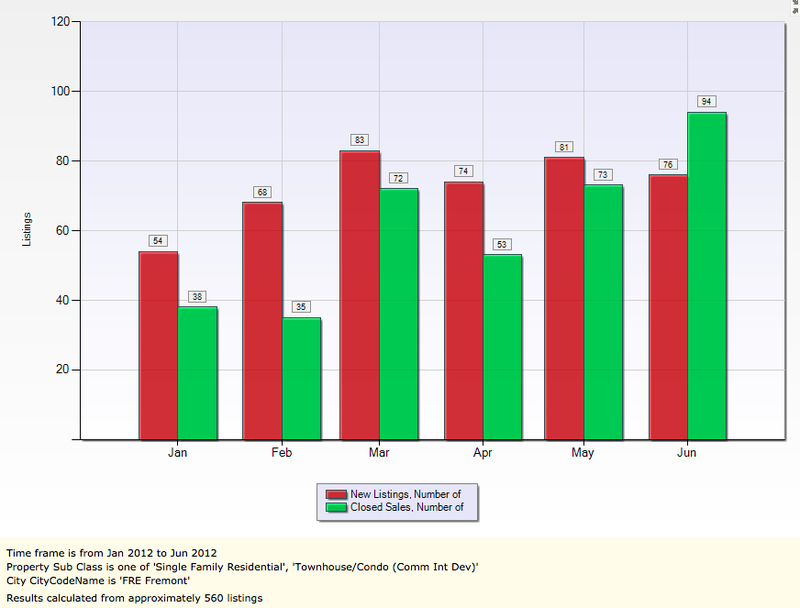 The chart below is for Fremont Single Family Homes, Townhomes and Condominiums aggregated. As seen below, Number of homes sold and the number of homes newly listed was quite low in early part of the year 2012 and even so, the number of homes sold was way lower than the number of homes newly listed for sale. The number of new listings were building up while homes were taking time to sell. 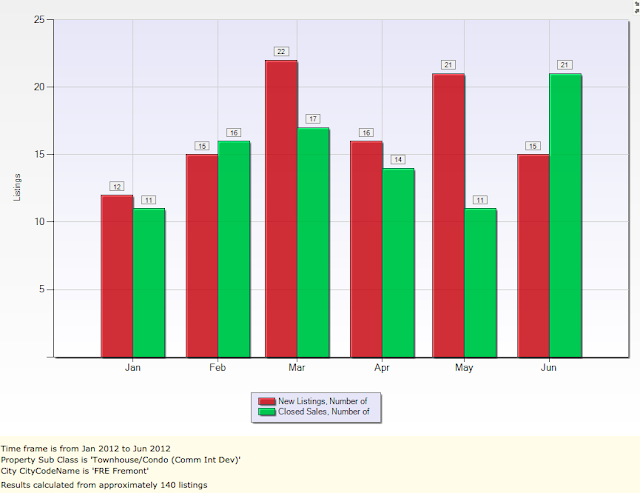 By March 2012, the homes sold number picked up at 72, to get closer to the number of homes newly listed for sale at 83, in Fremont. During May, and June, '12, the number of homes sold has exceeded the number of homes newly listed for sale, thus indicating a constriction of supply and an increase in housing demand by buyers. Now lets take a look at the breakdown of the above charts. Below is the chart for Homes Newly Listed for Sale versus Homes Sold covering Single Family Homes category. As in the aggregate chart, the number of homes sold were very low particularly in February 2012 but by March this number picked up to 55 getting close to the Homes Newly Listed for sale number for March at 61. During May and June 2012, the number of Single Family Homes Sold in Fremont were higher than the number of homes newly listed for sale again confirming the improved demand conditions while supply did not keep up. How did Fremont Townhomes and Condominiums do? And to complete the story, the chart below depicts the Number Of Homes Sold in Fremont versus number of newly listed homes for sale for the Townhomes and Condominiums category. Here the numbers show interesting facts. Demand keeps pace every now and then with the number of newly listed homes but tends to lag soon thereafter showing price sensitivity as pointed out earlier in this blog entry. As seen below, June was a particularly good month in that many homes sales were completed beyond the number of homes newly listed for sale thus showing that there is certainly a lack of inventory in Fremont City for Townhomes and Condo units. The above charts should help home sellers and home buyers in Fremont come to an educated decision on when to take action with respect to their real estate goals. Home Sellers have an unique advantage in a market filled with demand, however, in a price sensitive market, the list price of the home has to be commensurate to the expectations of the buyers which is very tricky. Call me for any help with selling your home and I will help you arrive at the right price and great offers to get you the best deal. Home Buyers in this market are vary of getting into multiple offer situations particularly in price sensitive markets such as Fremont. The best home price is the one you think makes sense from your budget, cash flow and perception of long term neighborhood and locality quality and outlook. So if you find a home that is the most ideal for your future, call me and I will help confirm your decisions and help you throughout the purchase process.